Audi has revealed the five-door 2014 Audi S3 Sportback. When compared to the three-door it has a wheelbase which is 1.4 inches longer, giving more interior space, no changes in the tailgate and rear bumpers. It comes standard with Audi drive select which handles characteristics of the electronic gas pedal, shift points of the optional S tronic and the steering ratio for progressive steering. It also features 7.5 J x 18 wheels. 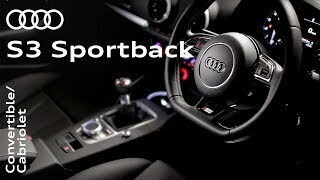 The Audi S3 Sportback is powered by the new 2.0 TFSI four-cylinder engine, delivering 221 kW (300hp) and 380 Nm (280.27 lg-ft) of torque with an fuel consumption of 6.9 liters per 100 km (34.09 US mpg). The engine can be mated to a choice of six-speed manual or S tronic automatic transmissions and is available in Audi's quattro all-wheel-drive system. 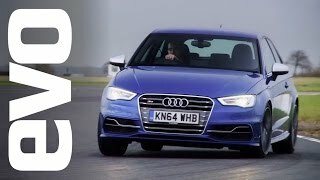 2014 Audi S3 Sportback accelerates from 0 to 100 km/hr (62.14 mph) in 5 seconds for the S tronic dual-clutch auto and 5.6 seconds for the manual-equipped S3 Sportback.